Kobelle proudly introduces its new Italiano Di Seta ring. For those who like unique designs in the jewelry they wear we offer the cobalt xf chrome 8mm Italian di seta finish two-tone flat wedding band. Italian Di Seta would translate to Italian Silk which is what the finish of this spectacular wedding ring resembles. The cobalt chrome construction is durable and resistant to scratches, and the larger size with brushed finish on the center band have very masculine feel. 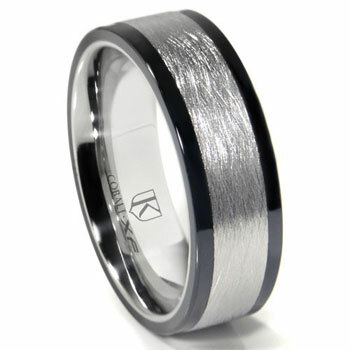 Our cobalt xf chrome 8mm Italian di seta finish two-tone flat wedding band will not bend, twist, kink, crush, or break. It is one of the strongest metal alloy combinations known to man. Additionally we offer a 100% lifetime warranty on all of if our jewelry we have available on our website. We sell not only cobalt chrome wedding rings but also titanium, and tungsten rings, necklaces, chains, pendants, bracelets, earrings, and accessories. We offer fast free shipping in the continental United States, and engraving services that you may need. Ring is stunning, and fits perfectly. I am very happy with this purchase. I love the ring, customer service, and the ease of the website. I will for sure be purchasing from you again!